Cat There are 128 products. 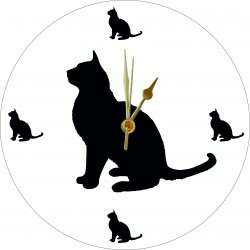 Acrylic clock with Abyssinian cut out and small Abyssinian cut-outs at 12, 3, 6 and 9. Available with a black background and white face or white background with black face. Each clock is 250mm diameter and 6mm thick. Lovely unique item ideal for any home or a gift. Each item comes with a protective film that needs to be removed before use. 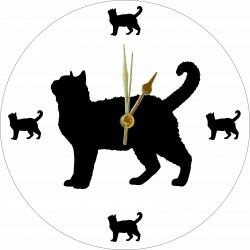 Acrylic clock with American Bobtailcut out and small American Bobtail cut-outs at 12, 3, 6 and 9. Available with a black background and white face or white background with black face. Each clock is 250mm diameter and 6mm thick. Lovely unique item ideal for any home or a gift. Each item comes with a protective film that needs to be removed before use. 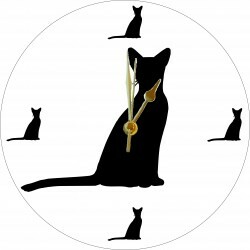 Acrylic clock with American Shorthair cut out and small American Shorthair cut-outs at 12, 3, 6 and 9. Available with a black background and white face or white background with black face. Each clock is 250mm diameter and 6mm thick. Lovely unique item ideal for any home or a gift. Each item comes with a protective film that needs to be removed before use. 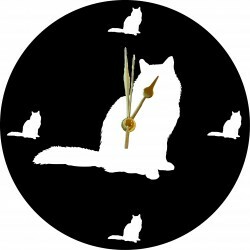 Acrylic clock with American Wirehair cut out and small American Wirehair cut-outs at 12, 3, 6 and 9. Available with a black background and white face or white background with black face. Each clock is 250mm diameter and 6mm thick. Lovely unique item ideal for any home or a gift. Each item comes with a protective film that needs to be removed before use. 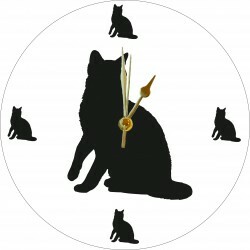 Acrylic clock with Arabian Wildcatcut out and small Arabian Wildcat cut-outs at 12, 3, 6 and 9. Available with a black background and white face or white background with black face. Each clock is 250mm diameter and 6mm thick. Lovely unique item ideal for any home or a gift. Each item comes with a protective film that needs to be removed before use. 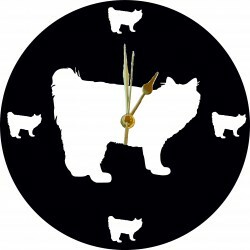 Acrylic clock with Asian cat cut out and small Asian cat cut-outs at 12, 3, 6 and 9. Available with a black background and white face or white background with black face. Each clock is 250mm diameter and 6mm thick. Lovely unique item ideal for any home or a gift. Each item comes with a protective film that needs to be removed before use. 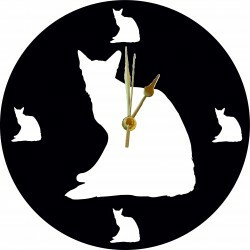 Acrylic clock with Balinese cut out and small Balinesecut-outs at 12, 3, 6 and 9. Available with a black background and white face or white background with black face. Each clock is 250mm diameter and 6mm thick. Lovely unique item ideal for any home or a gift. Each item comes with a protective film that needs to be removed before use. 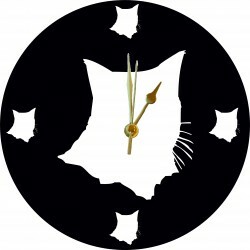 Acrylic clock with Bengal cut out and small Bengal cut-outs at 12, 3, 6 and 9. Available with a black background and white face or white background with black face. Each clock is 250mm diameter and 6mm thick. Lovely unique item ideal for any home or a gift. Each item comes with a protective film that needs to be removed before use. 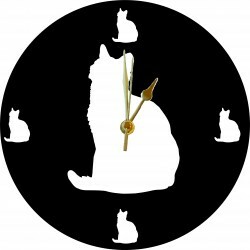 Acrylic clock with sitting Birman cut out and small sitting Birman cut-outs at 12, 3, 6 and 9. Available with a black background and white face or white background with black face. Each clock is 250mm diameter and 6mm thick. Lovely unique item ideal for any home or a gift. Each item comes with a protective film that needs to be removed before use. 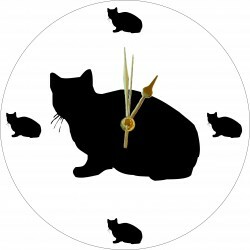 Acrylic clock with British Shorthair cut out and small British Shorthair cut-outs at 12, 3, 6 and 9. Available with a black background and white face or white background with black face. Each clock is 250mm diameter and 6mm thick. Lovely unique item ideal for any home or a gift. Each item comes with a protective film that needs to be removed before use. 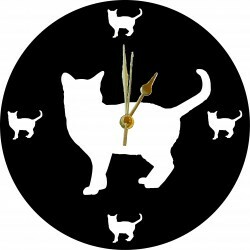 Acrylic clock with Burmese cut out and small Burmese cut-outs at 12, 3, 6 and 9. Available with a black background and white face or white background with black face. Each clock is 250mm diameter and 6mm thick. Lovely unique item ideal for any home or a gift. Each item comes with a protective film that needs to be removed before use. 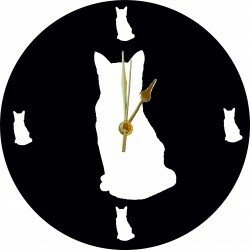 Acrylic clock with Burmilla cut out and small Burmilla cut-outs at 12, 3, 6 and 9. Available with a black background and white face or white background with black face. Each clock is 250mm diameter and 6mm thick. Lovely unique item ideal for any home or a gift. Each item comes with a protective film that needs to be removed before use.